Walking around Berlin you will often find TV sets, chairs, fridges, sofas etc. on the sidewalks. Some people seem to have no clue what they should do with these objects that they obviously don’t want any more. Sometimes these objects have a note “for free” attached to the object that will soon turn into trash, if nobody actually takes it away. Probably needless to say: usually I don’t really like all these objects and things lying around. And then there are these used mattresses. Often huge, often dirty, if not filthy – not a nice sight. 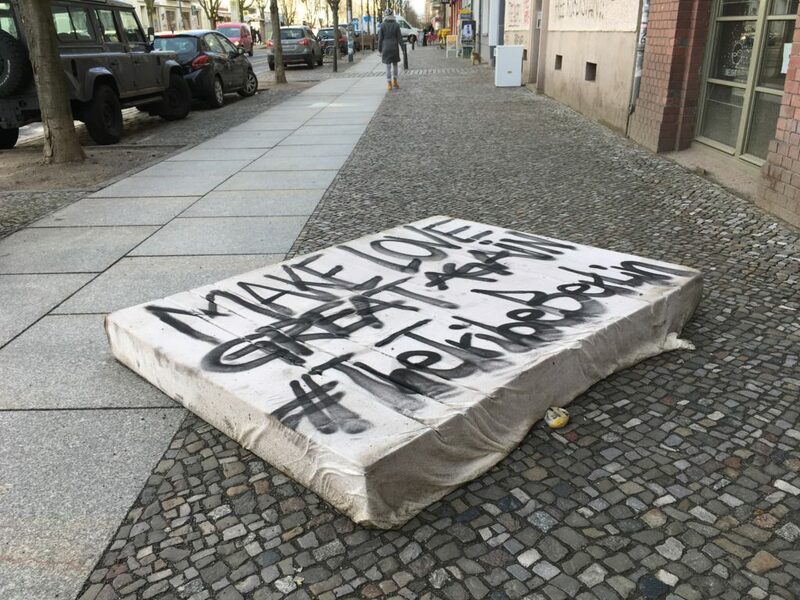 I guess mattresses are among the most disliked trash objects lying around in Berlin streets. But sometimes somebody writes a message on such a mattress – and then it becomes a whole different thing. This one at least made me smile – and I guess I’m not the only one who took a picture of that message: Make Love Great Again!